Finally they'd get a solid night's sleep now that he'd replaced the smoke alarm battery. She should also be pleased that he'd touched up that dark spot on the ceiling. Such were the dual benefits of (a) working from home and (b) being able to float. Unusually, he had his mother-in-law to thank. Returning from another once-in-a-lifetime holiday, she'd presented him with a fancy tin of coffee: Afro Espresso, "for that natural high!" He'd thanked her, of course, and put it in the cupboard to await its turn. Weeks passed and he found himself ploughing through emails one sunny morning. Half-ten, and there was that familiar pang -- need caffeine now. Blast, he'd finished his tried and trusted brand the day before and had meant to buy some fresh stuff. 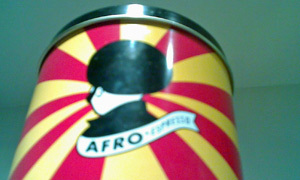 Anxious, desperate, clammy rifling through the cans and jars ensued until he pulled out the scarlet and gold Afro can. Hopes weren't high, but coffee was coffee. Machine primed, he'd watched the black gold ooze into his pre-warmed cup. Looks good, smells good ... and tastes amazing. A wave washed through him, tongue to toe, as he oscillated between woozy and razor-sharp. Hang on, why was that spotlight level with his eye? Don't look down, they say. He did, and remained aloft, feet dangling over the sink. Before he could get anywhere near coming to terms with whatever was going on, the back gate opened and a long ladder appeared. At the precise moment that he spotted the window cleaner's arm, he fell to earth, landing heavily as knees hit laminate, bam. There he stayed, awkwardly propped up against the washing machine, bruised and confused. After several minutes, he heard Mr Squeegee move round the back and felt himself slowly rising again. He was barely off the floor when he caught sight of his ungainly self in the gleaming tap: crunch, down he came. Up once more, this time with eyes shut tight. Breathing hard, he opened one eye: there was the cat. Reflexively, he flinched, expecting another rapid descent. Hardly bothering to look up, the cat tucked in to its dry food. Pressing his palms against the Artex, he eased his way into the hall. By avoiding all reflective surfaces, he was able to enjoy a good hour's worth of cloudlike hovering before the caffeine buzz subsided. Such a relief to have finally replaced that smoke alarm battery.